A beautiful card Sonia and I love the shape too. 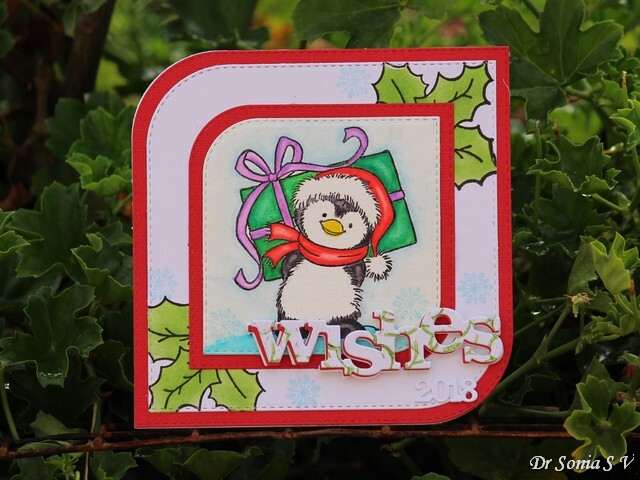 A super Christmas card Sonia, such a cute penguin and great shape. Beautiful and cute Christmas card,Sonia.Love the shape. Sooooo cute! LOVING that penguin!!!!!! Wonderfully colored cute Penguin. Like the pattern paper used for the wishes sentiment die. Fun and sweet card! I love the shape of it, and really love your coloring! Fun way to add a sentiment as well! Hope you are well!!! Love the 2 rounded corners, the image and colours. So cute penguin and LOVE the shape! Super CUTE! Totally LOVE the penguin!! I do like the way you've shaped the opposite corners and that is one cute penguin. Hugs Mrs A. Beautiful card!! Penguin looks so cute.love the card shape.